In a large bowl of a stand mixer combine 1/2 cup of the warm water with the sugar and yeast. Stir to dissolve the yeast and let rest for 5 minutes. Add the remaining 1 cup of warm water, and the olive oil, salt and vinegar. Begin mixing on medium-low speed, gradually adding the flour, and knead the dough for about 7 minutes, or until it's smooth and elastic. The dough should be slightly sticky, but not so sticky that it really sticks to your fingertip when touched. Cover the bowl with a dry towel and allow to rest in a warm place until doubled in volume--about 1 to 1 1/2 hours. Gently punch the dough down and place on a lightly greased or floured counter top. Divide the dough into 2 or 3 equal pieces (depending on how thick you want your crust/how big you want your pizza. I make three medium size, thinner crust pizzas. But you could make two larger pizzas). Roll and stretch your dough to desired size and thickness. Allow the dough to rest while you preheat your oven to 450 degrees F. If you have a pizza stone (or want to use a baking tray) place it in the oven while it preheats. Brush pizza dough lightly with olive oil and prick it all over with a fork. Pre-bake the dough on a hot pizza stone or in pizza pan for 6 minutes. Remove from oven and add pizza sauce and toppings. Return to oven and bake for 8-15 more minutes or until the crust is golden and the cheese is bubbly. I'm a little out of the habit of making homemade pizza, but Friday night rolls around and my body still tells me "it's a pizza-kind-of-night"!! I had the wonderful young women's from our Spanish Branch over last night and we taught them how to make pizza. We made about 15 personal sized pizzas and we figured out that each one cost about $1.50 to make! These soon-to-be and someday college students will amaze their roommates on their pizza skills. Here is the pizza sauce we used. Your homemade pizza sauce is ready to use! You do not need to cook it before spreading it onto your pizza dough. Lacee brought this to Book Club last night and I have to find a reason soon to make it!!! It's moist, sweet, a little chewy, light-seriously a perfect dessert! In mixer, blend vanilla sugar with zest from one lemon. Beat in eggs, one at a time. Add in salt and almond extract. Mix in the flour and melted butter. Pour batter into a greased and floured 9 inch cake pan. 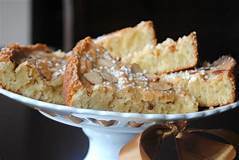 Sprinkle coarse sugar and almonds on top. Bake in a 350 degree oven for about 25 minutes. Remove from oven, cool several minutes before turning out of pan. Enjoy warm or room temperature! This was a Hello Fresh recipe that easy to make and definitely worth making again!! It just uses a few more dishes than I’d like but totally worth it. Marinate the white part of the green onions with 5 tsp. white wine vinegar and a pinch of salt. Sauté each vegetable separately (but use the same pan) with olive oil and season with salt and pepper until crisp tender. Place them each on a large platter and keep warm. In the same pan, brown ½-1 lb. lean ground beef-sauté with minced garlic, ½ tsp. ground ginger, salt and pepper until well done. Add 1 ½ T. soy sauce and a dash of cayenne pepper. Cook until crispy brown. Divide rice between bowls. Top with vegetables, marinated green onions, and sesame sauce mixture. Add more Siracha to taste. 2 new marinades for grilled chicken I've tried and really liked!! Then using your hands, form meat mixture into 1″ balls. (you should be able to get about 12 meatballs). Heat a large skillet to medium high heat. Add olive oil to the pan, and then add the meatballs. Cook each side for 3-4 minutes until they are browned on all sides. Remove from the pan and let rest. 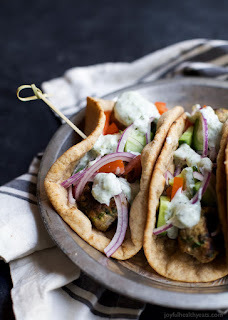 Assemble the gyros: to a flatbread (I like to warm mine up so they are more pliable) add 3 meatballs, sliced red onion, tomato, and cucumber. Then top with Tzatziki sauce.